So far in life, or so far this year? that’s quite an impressive list, colleen. and all while sweating on a bike, that is so you, and says so much. Oh gosh. . .hmmm. . .I suppose the platitudes about appreciating and living in the moment while planning for the future. Wake up with an empty chalkboard and go to sleep with a full one every day, Beth. Be kind always. Listen. Live in the moment. My mom taught me all of those things. To ask for what I want. If you don’t ask, unfortunately, nobody bothers to give. Things are often not as they first appear…take time to understand more. Be curious about other ideas and perspectives. I’ve learned that there isn’t enough time to adequately answer life’s truly confounding questions….and even if there were enough time, we still probably couldn’t answer most of them. and would we really like to know the answers after all ? Now that’s a good question!! That everything -everything- is constantly changing (energy in motion) – and that that’s a GOOD thing! Like Go Jules Go said. The only permanent thing is change. Great post, and great comments. I think everyone covered it! Wow, I’m not even sure. I’d have a hard time distilling that down to one thought. By time time you reach my vast age, and i really hope you do, you have probably forgotten most things you ever learned. Possible exceptions being always wear clean undies, don’t get into strange men’s cars, look both ways and remember what is said cannot be unsaid. But Im still learning new things every day while I grow younger. I have learned that what I feel in my gut should be listened to, what I feel is valid. For years, I have let others try to change that, usually those closest to me. Delightful post. I think the main thing I’ve learned is that if I sit quietly and listen, people will tell you things. But they also tell you far more than you want to know, so maybe don’t sit quietly. LOL. Happy New Year hugs! 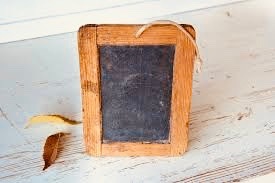 Blank slates have so much potential, if we only see beyond what’s not there and what is possible. treat others as you want to be treated and always no matter how much it hurts, to tell the truth!!!! !